Giraffes, penguins and white rhinos are among the 108 animals to die at the zoo. 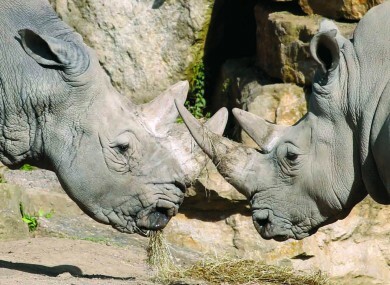 Two White Rhinos at Dublin Zoo. MORE THAN 100 animals died at Dublin Zoo during a two-year period between 2014 and 2016, it has been revealed. The dead animals include a significant number of critically endangered species that are extinct or nearly extinct in the wild. Among the 109 animals to die at the Zoo during the 24-month period were a southern white rhinoceros, two Rothschild giraffes, three grey wolves, and a red panda. The 68 that died in 2015 included seven that were temporarily on loan from other zoos. Details of the animal deaths at one of the State’s most popular visitor attractions are contained in inventory records obtained under the Freedom of Information Act. Documents submitted by Dublin Zoo to the National Parks and Wildlife Service (NPWS) as part of its licence application show that 13.4% of its animal population died in 2015. The animals that died at the zoo during 2015 include a pair of Rothschild giraffes, which are one of the rarest species of giraffe, with only an estimated 1,500 left in the wild. A spokesperson for Dublin Zoo said that the facility undergoes rigorous inspections each year, and that the latest inspection by the NPWS resulted in a number of positive comments in relation to habitat design, staff, and other areas. Animal care and wellness is at the core of Dublin Zoo. The physical and psychological wellbeing of animals in our care is the number one priority, ensuring every animal lives out its life to the full is paramount to Dublin Zoo. “However, as in the wild, animals die in Dublin Zoo. In every situation the best of veterinary care and attention is given. We mourn the loss of every animal,” they said. In 2014, two African hunting dogs were in Dublin on loan from another zoo. These are endangered with a population of around 6,000 left in the world. Both dogs died at Dublin Zoo. Three scimitar-horned oryxes, a species of antelope that has been extinct in the wild for almost 20 years, died at the zoo during the 24-month period. Three Humboldt penguins – considered “vulnerable” by the International Union for the Conservation of Nature (IUCN) – died in 2015. There are fewer than 12,000 of the penguins left in the wild due to climate change and overfishing. Three red-tipped mangabeys – a red-list endangered species of monkey – also died at the zoo during the same year; while an African spurred tortoise, which can live for over 150 years, also perished. The inventory figures analysed include mammals and reptiles but exclude insects, of which there may be large, approximate numbers and shorter lifespans. Email “Over 100 animals die in Dublin Zoo in two years (including some critically endangered ones)”. Feedback on “Over 100 animals die in Dublin Zoo in two years (including some critically endangered ones)”.